Peppermint ice cream always conjures up a mental image of super pink, sickly sweet, ice cream with large chunks of candy cane. Don't get me wrong, I actually like peppermint ice cream, and have eaten an entire quart container by myself (Adam doesn't care for candy canes in any form), but overall, it is definitely not a gourmet feeling ice cream. 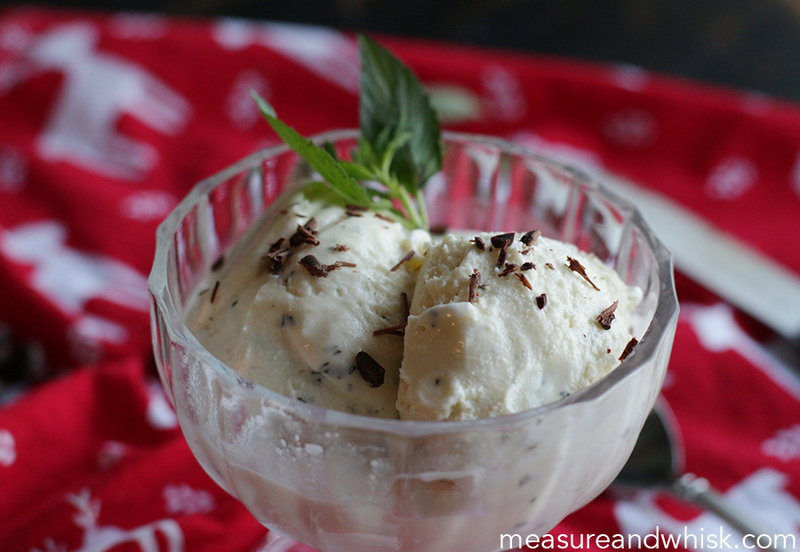 We got a few bunches of peppermint leaves earlier this fall in our CSA, and I really wanted to try to make a peppermint ice cream with it. 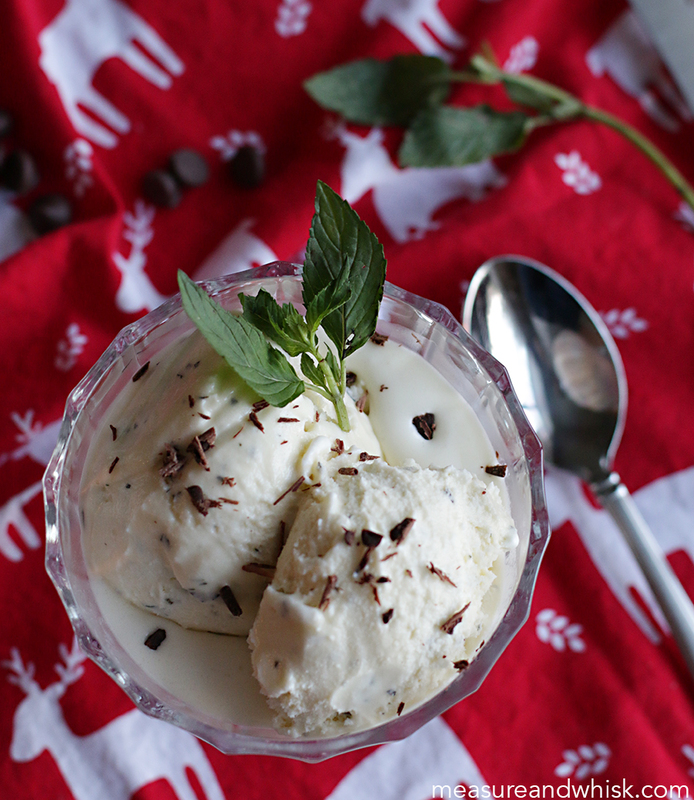 This peppermint ice cream is smooth and creamy, has tiny flecks of peppermint leaves and is topped with tasty chocolate. 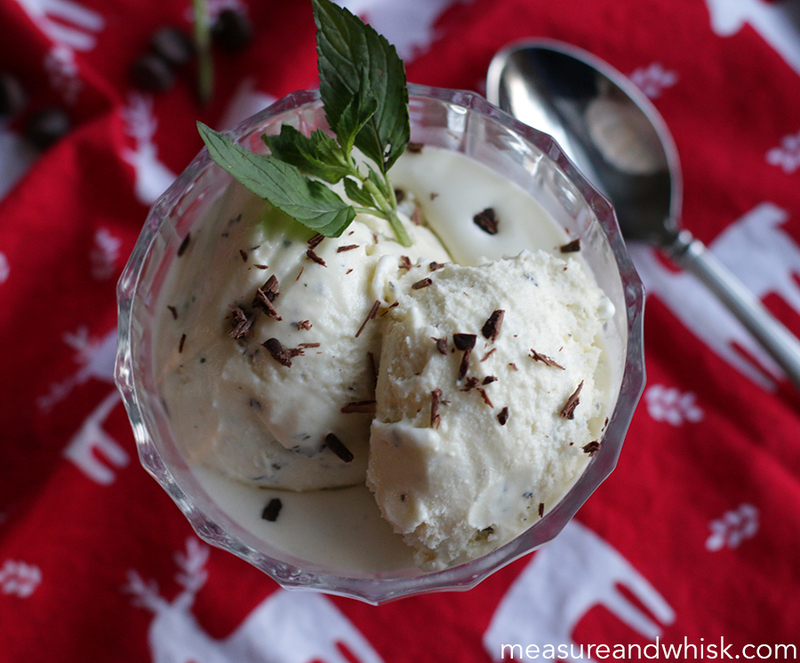 It isn't your run of the mill peppermint ice cream, but feels so much more sophisticated, and has a beautiful flavor and texture. I love making natural alternatives to what you can buy at the store, and this one was particularly satisfying. It is a perfect way to kick of the holiday season! Combine the sugar, 1 cup of the cream, 1 cup of the milk and peppermint leaves in a small saucepan. Heat the milk until it beings to steam, then pull it off the burner, cover it and let it sit for 30 minutes. While your peppermint mixture is sitting, combine the egg yolks, and the 1/2 cups of cream and milk in a bowl. Stir until smooth. Once the 30 minutes is up, put it back on the burner and begin heating it (not too hot), and take 1/2 cup of the peppermint mixture and slowly pour it into the egg mixture, stirring all the while so the eggs don't cook. Then, slowly pour the egg mixture into the peppermint mixture, while stirring, then let it heat up slowly (keep stirring it) until it coats the back of the spoon. Remove from the heat, and refrigerate it for 2-4 hours. Following the manufacturer's instructions, pour it into an ice cream maker and let it churn until a soft serve looking ice cream has formed. Remove from the ice cream maker and put it in other airtight container. Freeze for 4-6 hours or overnight. Enjoy! I love peppermint but I'm not a fan of the candy cane-style ice creams (more of a mint chocolate chip girl!) so this looks absolutely perfect! If I had an ice cream maker I'd probably make it today!